incredible…incredible…incredible… tanks Dr. grego…tanks GOD. » What do you think??? Good find. I had heard that this technique was being tested by him but had not heard any news until now. One of the interesting things about this is that he claims scalp wounding (aka prestimulation, needling, dermarolling, etc) to atleast encourage some growth. It seems that within the last couple years some form of wounding has been integrated into the more promising experimental treatments such as Follica and ICX (not sure if Aderans uses prestimulation as well like ICX?). While I havent seen visible results, I’ve tried out skin needling just recently and overall its helped significantly with my MPB itch. Im cautiously optimistic about Greco’s treatment. Might be worth getting done as an experiment. $900/yr is not much more than the cost of Propecia and maybe the results are really as good as advertised. » » What do you think??? » Aderans uses prestimulation as well like ICX?). » maybe the results are really as good as advertised. 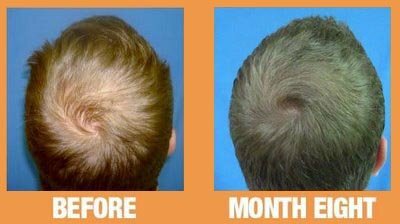 This is fantastic news, I spent way more than 900 a year on Propecia minox etc, it is definitely worth a shot. Does it say anywhere when it will be available? » Does it say anywhere when it will be available? » » Does it say anywhere when it will be available? Oh right I see, am I right in saying it only works for diffuse thinners and not people receding? This could be huge. It MIGHT be. But we need A LOT more info about this before we get too excited. The footage of the patient in the video before/after was not revealing enough IMHO. Plenty of scams or nearly-worthless MPB treatments have been introduced with similar videos. And I’d like to see it confirmed that the patient in the video did not also begin (or increase) taking conventional MPB meds at the same time as this procedure. This “little detail” about the patient’s results IS NOT something to overlook. I wanna see more proof, more patients, more before/after comparisons, and more specifics about how it “stops growing” after a year. I think its looks good! Ummm… really? This looks like it needs more attention. How could this be missed for an entire year with how much obsessing this board does? I am missing something or the woman in that video says that this is not for everyone? however where the hell is the Dr. Greco and this can work on temples? Can someone tell me what exactly is platelet rich plasma? » Can someone tell me what exactly is platelet rich plasma? A concentrated version of your blood. He is in Florida, she said only for people with thinning hair, whatever that means. I found this before and after from Dr. Greco’s blog, maybe I can finally stop taking Propecia! This 26 year old patient was unable to take finasteride (Propecia™) do to side effects. Hair transplantation was done in the anterior hair line and the posterior crown was traumatized with a 1 mm micro needling roller (Clinical Resolutions, Inc, Beverly Hills) and platelet rich plasma (PRP) concentration was injected. Fig 1 below was before and Fig 2 was the patient 8 months later. Wonder when it will be available on the Nationwide or at least somewhere on the West Coast. That’s the beauty of it, I think any doctor can do that. Certainly worth keeping an eye on. No good for the NW6s of us, but if you’re thinning / miniaturising it could be a way of preserving them. Just every year spend $900 and bam! Your hair is fine for a year. If it only acts as a “keep what you’ve got” treatment it’s certainly safer and more convenient than the current meds, and judging from the results on the blog, more effective too. This could be big, as a true “maintainer” would be great news. People could go for Armaniesque transplants without fear and without thinking about donor conservation. Early balders could stop it in their tracks. » be missed for an entire year with how much obsessing this board does? While it hasn’t gotten as much attention as Follica, ICX, Aderans, and Histogen, it has been brought up before. He received a grant from ISHRS sometime back to do this research. » about donor conservation. Early balders could stop it in their tracks. Not fair man, I am NW6/7, so this would not help me at all??? Great.